Posted March 19, 2017 • filed under Experience. 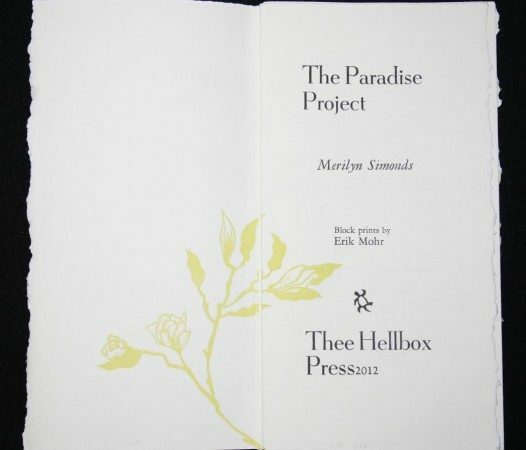 Recently, my collection of flash fiction, The Paradise Project, was published simultaneously as an ebook and in a book-arts edition using technology that would have been familiar to Johannes Gutenberg: hand-set type impressed on handmade paper with a hand-operated press. As the two versions progressed, I had a stunning realisation: publishing has circled back to its roots. I, the writer, was expected not only to produce the words, but to collaborate in both the making and the marketing of these past and future books. To that end, I spent time in the studio with the paper artist commissioned to produce the endpapers, using plants from my gardens. 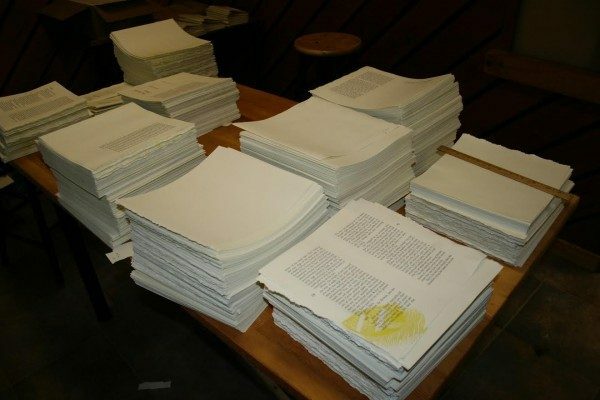 What started out looking like a slurry of wet Kleenex did indeed resemble a sheet of limp paper on a humid day by the time she lifted it from between the blankets of the paper press. I found it hard to see that tiny dimple as an imperfection. The entire landscape of the page was a riot of dips and clumps, knots and swirling fibres, as if the paper itself were supple, complex, alive. 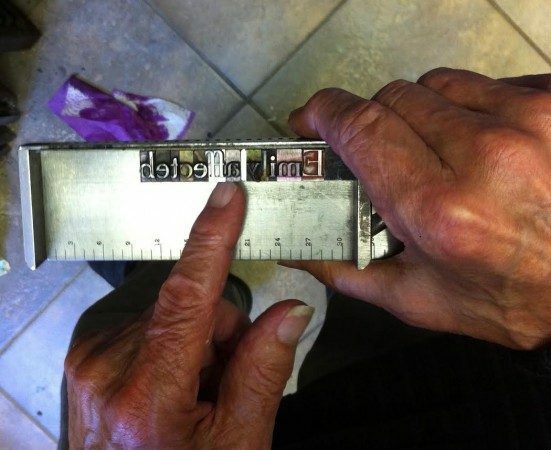 A few months later, the papermakers, typesetters, proofreaders, and Hugh Barclay, the irrepressible octogenarian owner of Thee Hellbox Press, gathered to put The Paradise Project to bed. One by one we took our turns at the flywheel of the antique Chandler & Price press. After this, the metal letters would be dumped into the hellbox, the 294 printed copies would be bound, and there would never again be books that were exactly like this. While the others hoisted glasses of single malt to toast the occasion, I read the story, thinking how fine a gathering of words could sound when they were this beautiful on the page. Then I noticed, in one corner, a faint smudge. I peered more closely. The smudge was clearly a fingerprint. There are no fingerprints on the ebook version of The Paradise Project, only the smudges readers leave on their plastic e-ink screens. That’s not the only difference between publishing in paper and pixels. 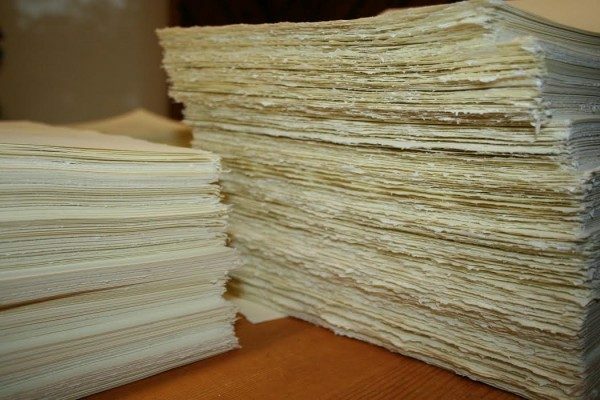 While Hugh and I chose hand-made rag paper for the guts of the letterpress book, my ebook-designer son, Erik, and I blithely skipped past considerations of heft, texture, colour, and tooth. Epaper combines ink and paper in one; even typeface is delivered as digital software that a reader can adjust to any size in several different fonts. For hours I toiled in Hugh’s grubby studio, hunting-and-pecking metal letters and sliding them, upside down and backwards, into a chase, but with a few strokes to Erik’s keyboard, my text instantly flowed into an EPUB file. Does that make a book designer as redundant as the guy inking metal type with a leather pouch? Well, no. My son sent me the pages of Paradise as a file that I say is onscreen, but it wasn’t. The pixelated image of the words were on the screen; the file itself was a knot of coding, an intangible, almost-indecipherable Rosetta stone. The designer’s skill is in making the text accessible across every electronic reading device now existing, and yet to be invented (as they like to say in film contracts). I played with the EPUB file on my old and new phones, my iPad, my laptop and ancient desktop, shrinking the text, then blowing it up until I could see it across the room. No matter how I manipulated the words, the flow was perfect. 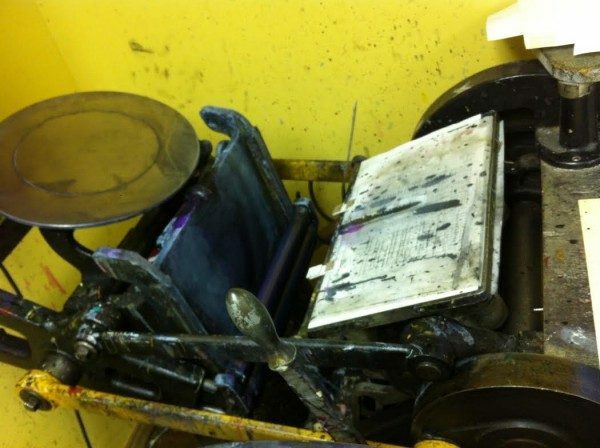 The printed page that Hugh pulled off the press was a material object. It rustled lightly in my hand. 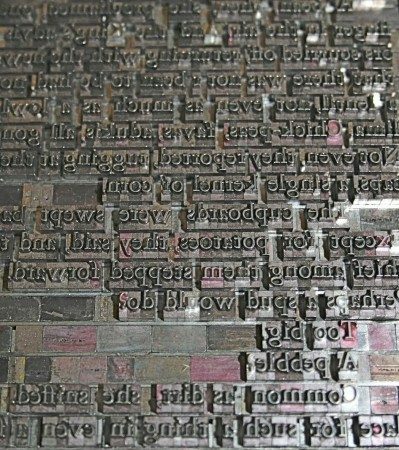 I recognized the words that I wrote, the metal letters that I slid into the chase that Hugh set in the press, perfectly inked, to make the words appear on that rectangle of pressed rags. I looked at the page head-on, as I might look at a painting. 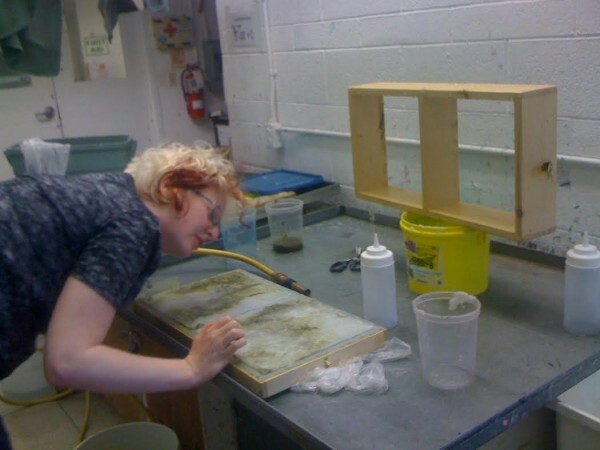 Then I held it up to the light, as the paper-maker taught me to do, to look for variations in opacity and how the paper fibres were dispersed. She called this the look-through. 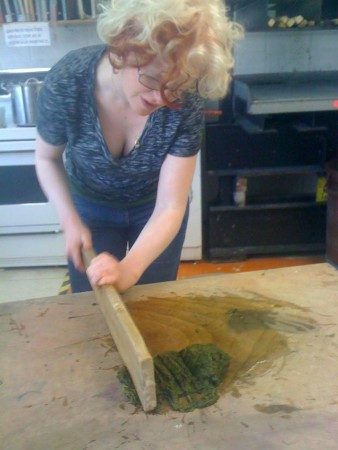 Then I held the printed page at a raking angle to the light—the look-down—to check the texture on the surface caused by the felts, the moulds. I watched for papermaker’s tears. Hugh plucked it out of my hand and offered it to me again, on edge. “Like this,” he said, holding it perfectly flat, at eye level. I looked across the terrain of the paper, its landscape of hills and hollows cradling thick, chocolate ink. I could have got lost in there. Merilyn Simonds, author of 17 books, including fiction, memoir, narrative nonfiction, and collaborative projects, most recently a multimedia symphony “Dear Life”, based on an Alice Munro Short story, for which Simonds created the foundational text and script. Her most recent book, Gutenberg’s Fingerprint: Paper, Pixels & the Lasting Impression of Books, is published in April 2017 by ECW Press.